Maserati - I Say Ding Dong Shop - Buy Stickers, Decals & Unique Automobilia. Fispa & Ferrari Fuel Filter Canister Sticker. 3". FISPA Torino Italy Air Filter Air Con Sticker. 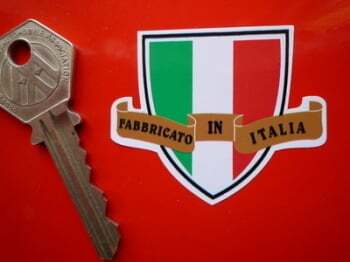 Ferrari Maserati etc. 3.75". HT Lead / Distributor Identifier Stickers. 2 sets of 1 to 12 (24 stickers). 5mm. IPRA Torino Gold & White Oblong Stickers. 2" Pair. Magneti Marelli BK2A Antidusturbo Radio Coil Sticker. 2.75". Magneti Marelli Bobina Superpotente Coil Sticker. 3". Maserati & Agip Servizio A Service Sticker. 3". Maserati 'With Shell Oils' Service Sticker. 2.5". Maserati Air Filter Ignition System Warning Sticker. 5". Maserati Air Horns Chrome Style Sticker. 40mm. Maserati Black & Cream Eliptical Stickers. 4" Pair. 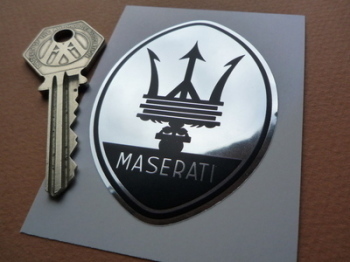 Maserati Black & Silver Oval Stickers. Set of 4. 1.75". Maserati Black & Silver Round Stickers. 2.25" Pair. Maserati Chrome Style Sticker. 50mm. Maserati Coloured Wheel Centre Stickers. Set of 4. 50mm.